I have been continuing to look at and work on creature AI over the last week, and believe I have reached a point where I am able to enable monsters to do a little extra if need be. Some thanks must go to Derek (Chaos Wielder of Shagret), who showed me some examples of overriding AI scripts. For those who are not aware of his work, be sure to check out his site. My thanks also goes to Pain once again, who has continued to help me understand a little more of what is going on behind the scenes. In the course of our chats, he guided me to the Common Script Library, which I have also posted a permanent link to in the left hand pane. After being inspired by seeing a rework of the store GUI using different textures, I decided to set aside a little time to finish off my own store GUI. Below is the result of combining the two GUIs I had already designed (first seen in this blog post) into a single new one. Personally, I much prefer the colours in the new design, and am pleased that I was able to include all the extra store information into the single GUI without compromising the information given. Furthermore, it has now been made clearer to the player which stock is new or limited in nature by showing it in a light blue font. 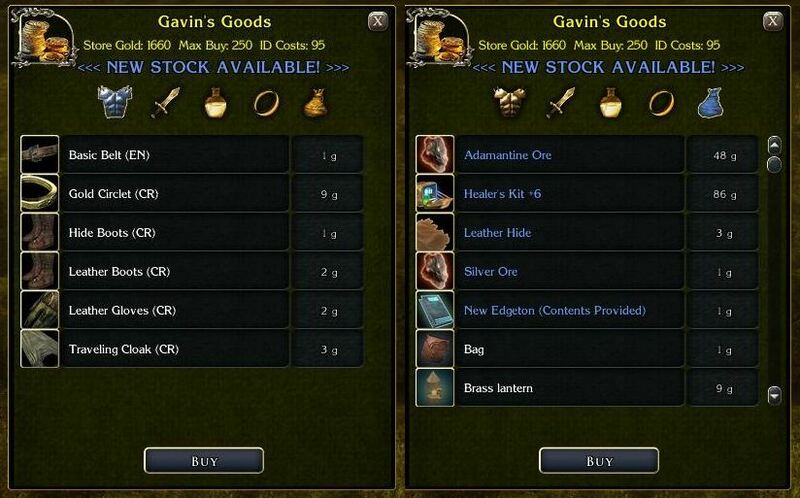 Check out the image below, which shows two pages of "Gavin's Goods". As regular readers of this blog will know, my aim with stores was to make them exciting places to visit by adding random elements to them. 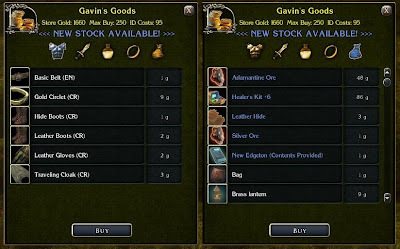 Now, not only do some stock items change from time to time, but even the cost of having items identified may change sometimes. During my course of looking at creature AI I came across a game bug. For those who may not be aware, there is a bug in NWN2 that causes the game to crash when a player has a henchman in their party and they try to leave the game. After discussing the problem with other players, especially Matt Rieder of The Wizard's Apprentice, I set out to fix the problem. At Matt's suggestion, the problem was resolved by adding some code that removes any henchmen before the game exit calls were made. It involved editing the optionsmenu.xml and adding one script, but the end result appears to work well. I even added some code that reattaches the henchmen if the exit is abandoned. I have uploaded the Henchmen Game Crash Fix (LB) to the Vault for those interested in the fix.